Eclipsed by the media coverage of Darfur and South Sudan, a little-known rebellion lingers in the southeastern corner of Sudan. 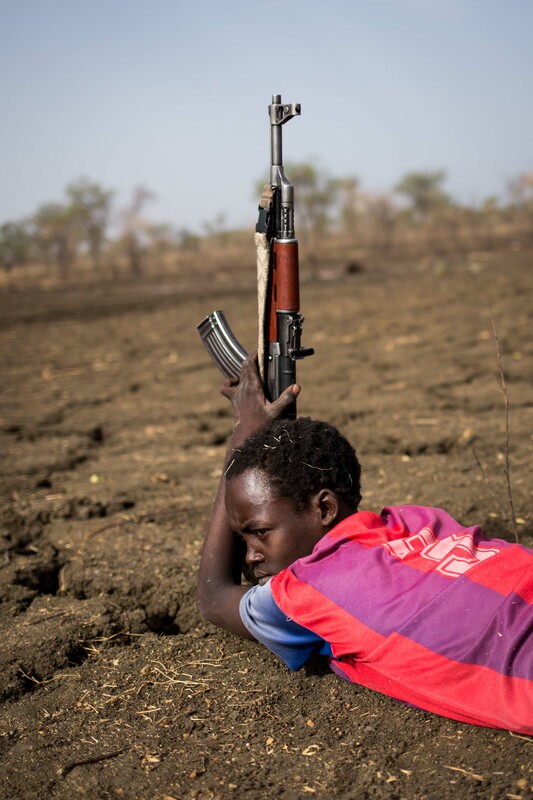 The roots of the conflict are long and winding, but for the civilians caught in the midst of Blue Nile's insurgency the effects are immediately real. In this interactive multimedia report, IRIN investigates the humanitarian crisis and military struggle. Ahmed has invested too much in the hyena to let her go now. He keeps her chained to a post, feeding her scraps of food, skin and bones that could have nourished him, his wife and his hungry kids. Kafe is part of the household; everyone suffers together. "If the children eat, the hyena eats. If the children don't eat, the hyena doesn't eat," Ahmed chuckles grimly. You hear Kafe before you see her. A painful squawk-moan emanates from the rakuba, a grass-weaved structure serving as her cage. Inside is a scraggly, boney, bleating mess. One of Kafe's hind legs is broken after a serious beating. Ahmed can't injure her too badly though, or he won't be able to sell her should this war ever come to an end. Ahmed's home is a bone-jangling, 15-minute drive from Tanfona, a garrison town in rebel-held territory. Like the rest of the southern slip of Blue Nile State controlled by the Sudan People's Liberation Army-North, Ahmed's home is barren. When the rains fall between May and October, the land turns a luscious green. Right now, that's hard to imagine. Everything is beige: the dry earth, the yellowed huts, and skinny Kafe. Dust particles are visible in the light shafts that glint across the dead ground. A dense heat tops more than 45 degrees. The few trees on Ahmed's property are too thin to provide substantial shade. The hyena's cries add a surreal element to the scene. 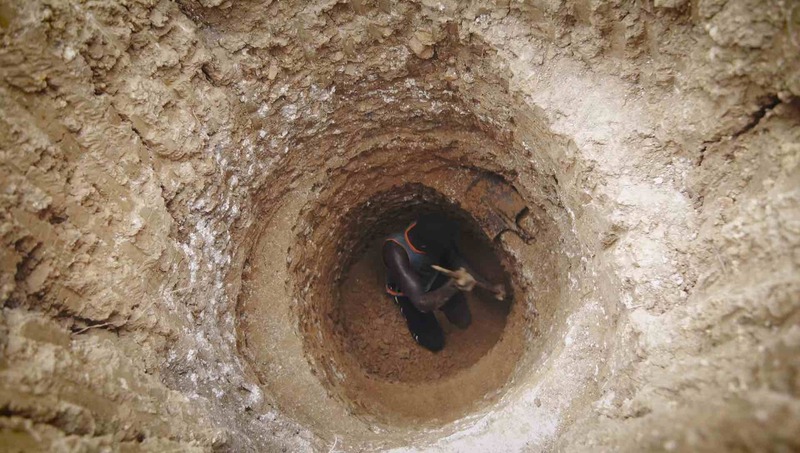 Several hand-dug foxholes dot Ahmed's homestead. They are the sole protection against the Antonovs, the Soviet-era cargo planes-turned-bombers that indiscriminately drop explosives on civilians as well as rebel fighters. 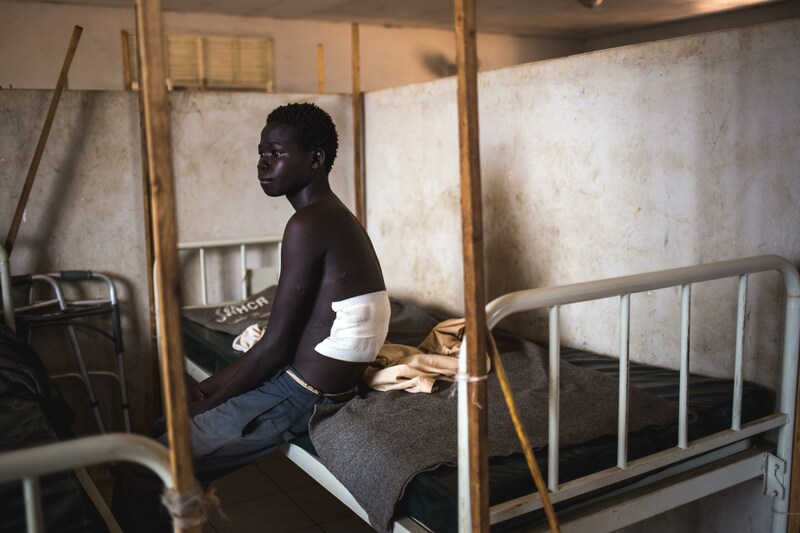 There's no concrete number, but humanitarian and human rights monitors on the ground say more than 4,000 bombs have been dropped on SPLA-N-controlled territory in Blue Nile in the past five years. In one week, between the 6th and the 12th of May, 69 bombs were dropped. Like everyone else in Blue Nile, Ahmed's family is attuned to the Antonov threat. They know from the hum of the plane's engines when they are passing at a safe distance, and when to take them seriously. The Antonovs are sent by President Omar al-Bashir, the man who has ruled Sudan for 26 years. The first sitting head of state to be indicted by the International Criminal Court for genocide and crimes against humanity (committed in the western region of Darfur), Bashir has had a hand in well over two million deaths across Sudan. 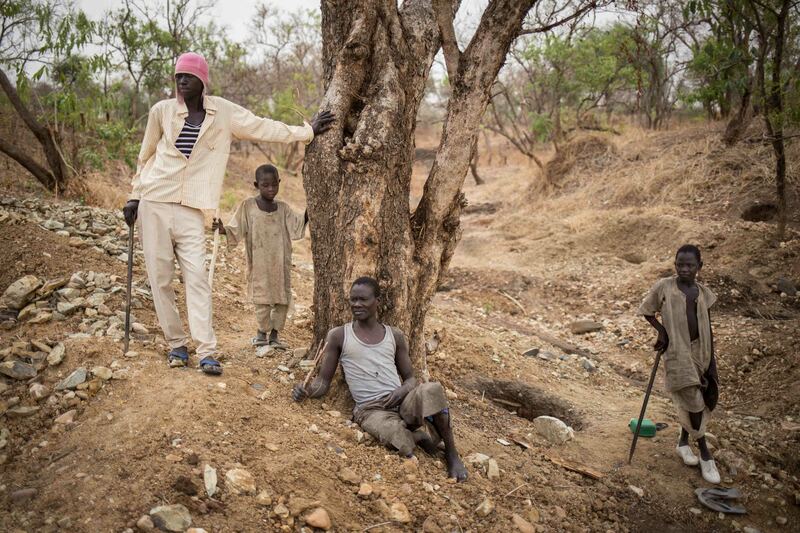 Blue Nile sits on the southern frontier of Sudan, where war has raged for more than 60 years. It's the second front of the Sudanese rebel resistance movement. The first is to the west, in South Kordofan's Nuba Mountains. 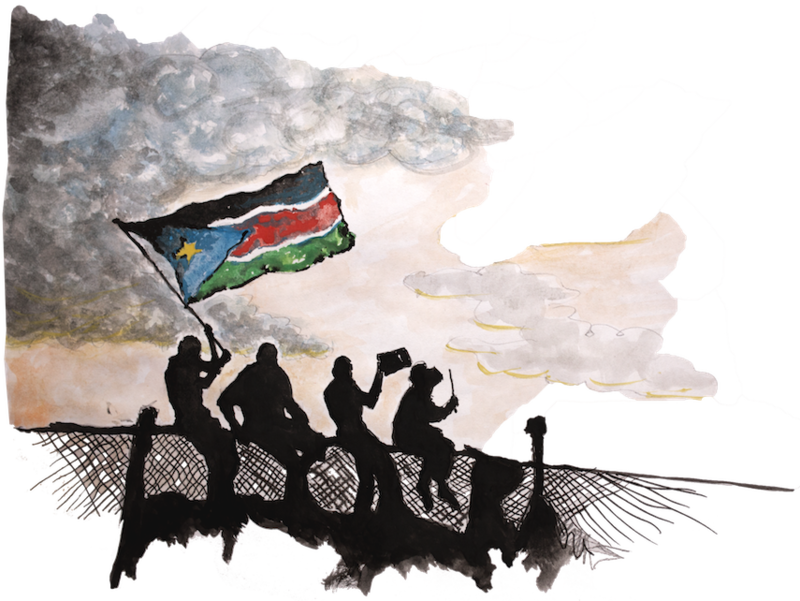 The fight is a continuation of the struggle that birthed the world's newest nation, an independent South Sudan, in 2011. Characterised by mass displacement and severe hunger, the humanitarian crisis has been compounded by the evacuation of all aid organisations. More than 10 peace deals have fizzled since the conflict re-ignited only a few months after South Sudan became independent. Its frontlines are largely stagnant. Blue Nile State sits wedged in the southernmost part of Sudan, with Ethiopia to the east and South Sudan across the western border. On this map, the purple areas represent sites of active fighting. The original front line cuts northwest across the state. The Ingessana Hills, rebel leader Malik Agar's birthplace, is the only patch of SPLA-N controlled territory north of the front lines. 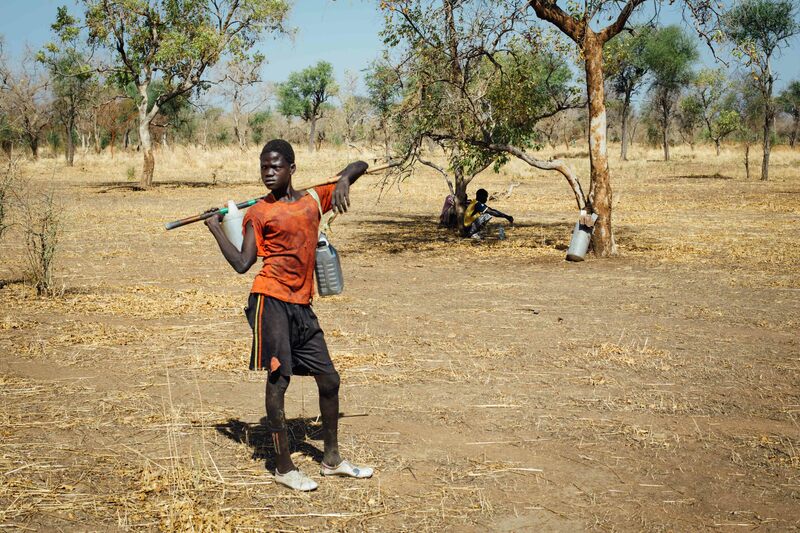 There isn't much in SPLA-N-controlled Blue Nile, including people. Today, there are only about 80,000. More original inhabitants live outside the state than inside. More than 130,000 are in refugee camps across the border in Maban County in South Sudan; another 40,000 are in camps in Ethiopia. According to a 2008 census, Blue Nile State as a whole, including both government and rebel-held areas, numbered 800,000 people. Even before the war restarted, Blue Nile was poor. Now, it's desperate. The markets are bare, save for some sorghum, rice, and a handful of tomatoes in the biggest one in Yabus, the de facto capital. Sudanese are renowned for their hospitality, but today the people here can't even offer guests the signature piping hot tea, laced with tablespoons of sugar. 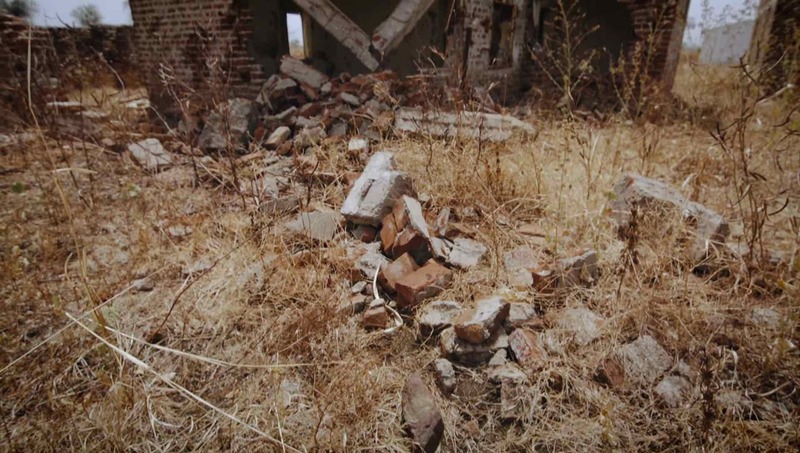 Carcasses of trucks, bombed-out schools, and abandoned homes are everywhere. Trees have shrapnel in them and weeds smother rusted tanks. 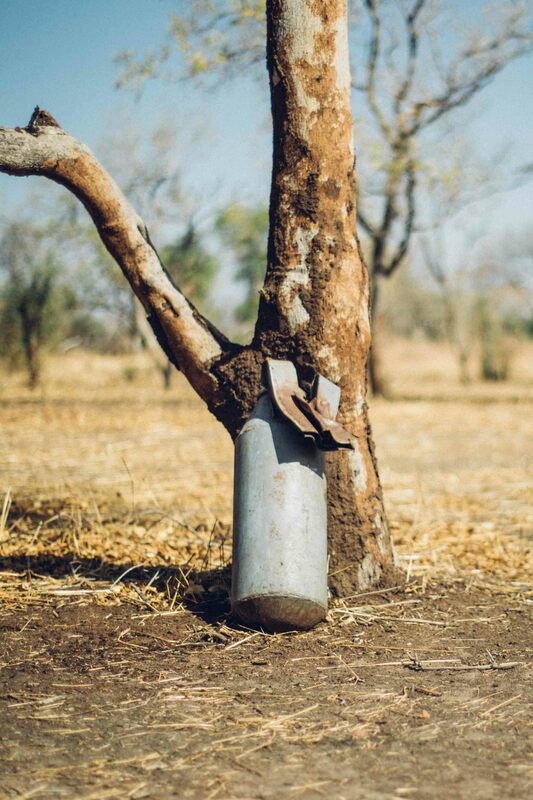 A massive, unexploded shell leans against a bark-stripped tree outside Tanfona. The SPLA-N doesn't allow driving at night because lights could attract Antonovs. If you're on the road in the evening, one of the many checkpoints will inevitably tell you, politely but firmly, that your trip is finished. 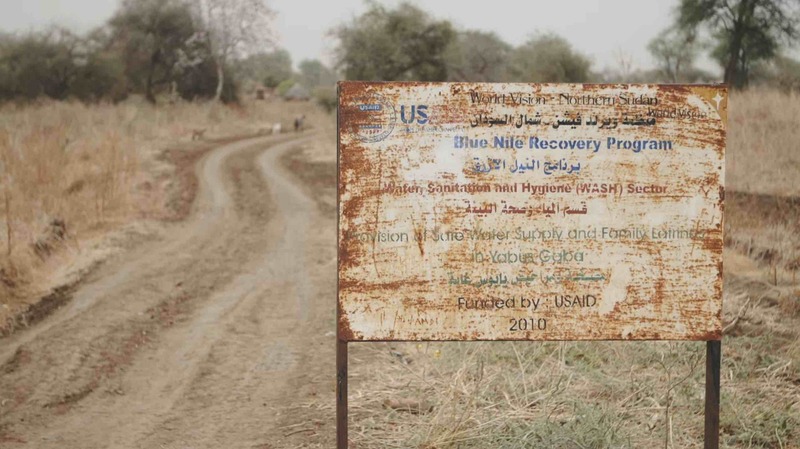 The Famine Early Warning Systems Network rated Blue Nile at Phase Four: Emergency. Phase Five is Famine. Khojli Bashir, director of the Funj Youth Development Association, a local NGO, believes the coming year will be worse. "We are expecting so many people will die," he says. Drought and the bombing of farms has kept harvests from bearing fruit. Food stores are meagre. 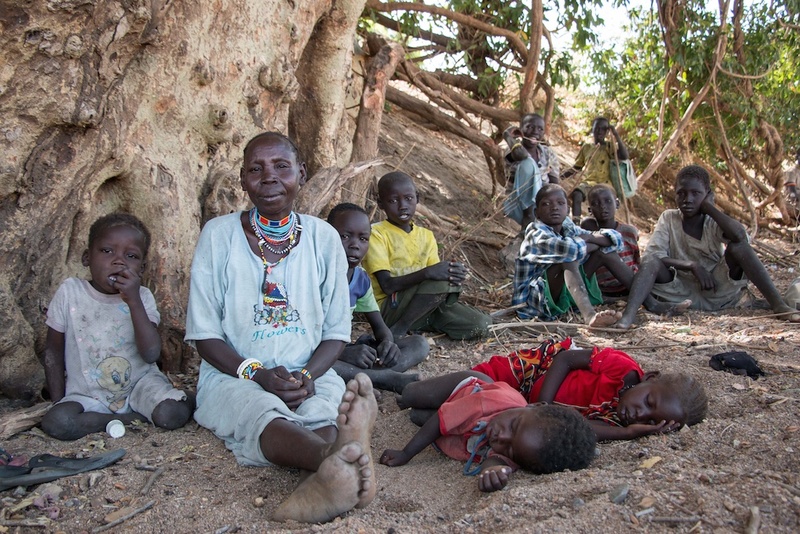 There are no functioning clinics in SPLA-N-controlled Blue Nile. The few professionals who remain have nothing in the way of medication, supplies or equipment. In Goss, a small village outside Tanfona, Mansour Abdallah, a nurse, keeps the Panadol he has in his pocket. The jellabiya he wears is crisp and white, a nod to the white coat and a last grasp at professional dignity. When we came to speak to him, a line immediately formed outside the shack that serves as his office. The people outside were hoping the foreigners might be dropping off medication. Education is equally non-existent. 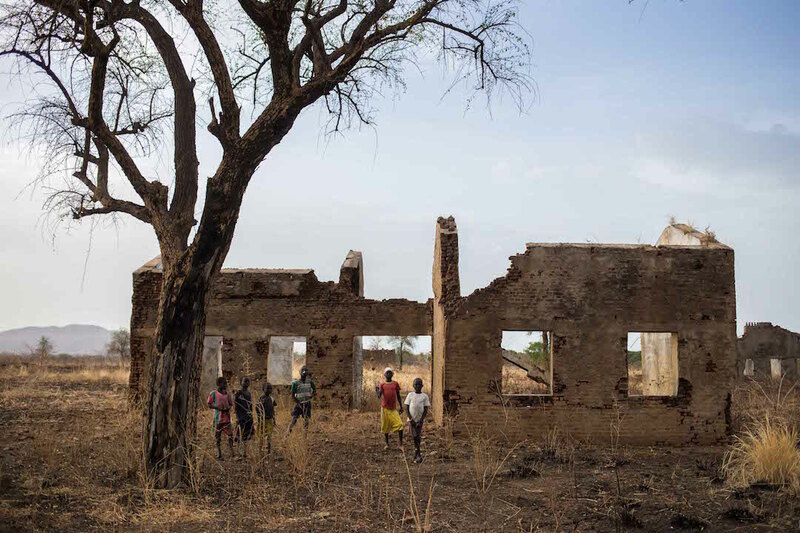 Even before war broke out, there were no secondary schools in southern Blue Nile. Young children walked for hours to reach the nearest primary school. Now, children are everywhere during the day: playing, helping out at home, and carrying water. The few barely functioning schools in Yabus have no supplies. No teachers still working there have more than a primary school education themselves. "The education right now in Blue Nile is zero," says Bashir, of the youth development association. Mayak is a small settlement close to the frontline, which stretches across Blue Nile. Just outside town, a path leads to a wide, dry riverbed. Trees lining what would be the bank hang over the empty stretch of sand, their shadows providing protection from the sun but no relief from the heat. Groups of people — mostly women and kids — are spread out, each under a different patch of shade. Ayat is striking, in her strings of colourful beaded necklaces, the only jewelry we saw in Blue Nile. A mother of 10 children, she sits with a snoozing baby, her children scampering nearby. Ayat's seven youngest are with her, but her three eldest are still in Kurmuk, a city that fell to the government soon after the fighting started in 2011. She hasn't seen them since. Her husband, a rebel soldier, was killed in battle. "I am really suffering," she says. "Maybe, if he was here, we could share this burden together." 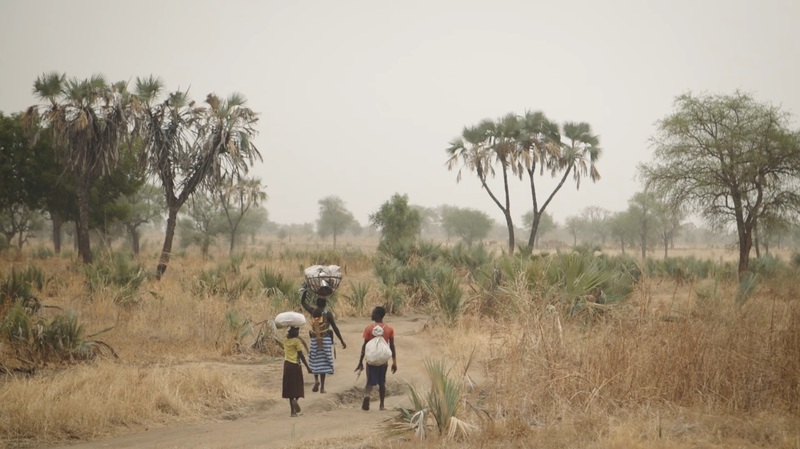 Ayat doesn't want to go to Maban, across the South Sudanese border, because she hears people can't move freely as a result of tensions with the host community. She worries for her children's safety there. She also worries for them here. The kids, in school until recently, were bombed on the way to class and now refuse to go back. Ayat says her life is so hard she sometimes thinks she'd be better off dead, if she could guarantee her children would be okay. Access to aid has been one of the biggest obstacles in moving peace talks forward. 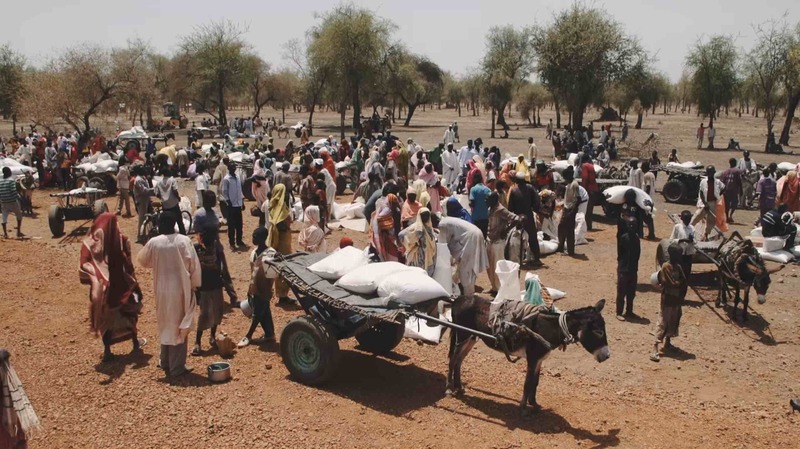 The SPLA-N is demanding humanitarian relief before political talks begin; the government wants a "cessation of hostilities", ahead of a national dialogue held in Khartoum, as a pre-condition for humanitarian relief. 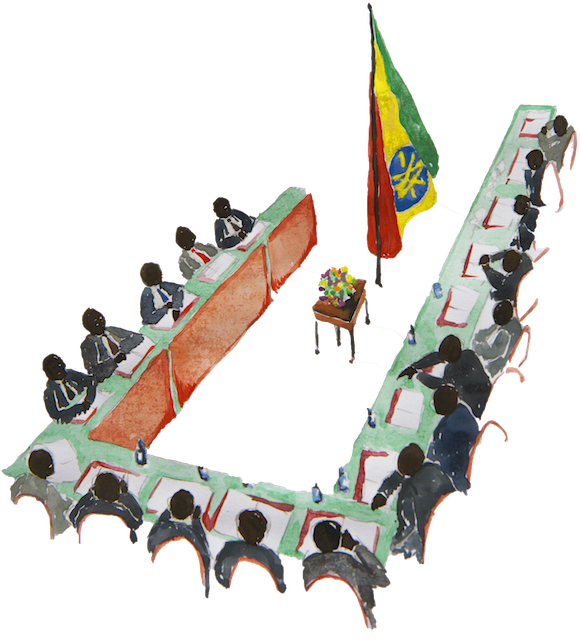 After a meeting in Addis Ababa in November 2015, the parties finally agreed to begin with aid, but then they failed to come to a consensus on how it would be delivered. The SPLA-N wants the relief to come via South Sudan and Ethiopia; the government insists it should arrive through its territory. The SPLA-N says that's unacceptable, as along with the aid could come government spies. Travelling from South Sudan, it's surprisingly easy to enter Blue Nile. The opposition army in Sudan gets no trouble from its former comrades-in-arms, the SPLA, which runs South Sudan but which for two years has presided over its own bitter and tragic civil war. Passes are obtained in the capital, Juba, and it's about a three-hour flight, including the layover in Maban in the far north of South Sudan's Upper Nile State. 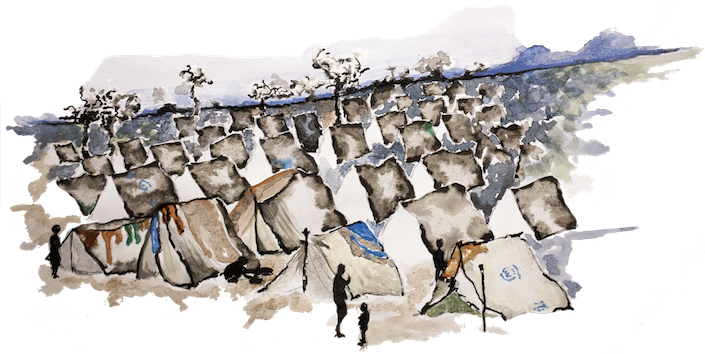 On the outskirts of Bunj, the main town in Maban County, are four sprawling refugee camps in which 130,000 people now reside. Maban is Blue Nile's lifeline. Food, fuel — and everything else in between — is traded in the bustling markets and walked back over the border. A combination of impassable roads and armed militias that loot the trucks bringing supplies from Juba means everything is flown in — from the food and medical supplies that assist the refugees, to the containers in which the UN workers live, the 4x4s they drive and the diesel they use. Despite Maban's relative prosperity, more than 90 refugees have been killed as tensions over resources reached a tipping point. A population of around 60,000, the Mabanese fare little better than the refugees — some might say worse. There is war and hunger in their own country. They have nothing to spare. Fights routinely erupt over land, firewood and other basic essentials. Tensions increased when the World Food Programme cut rations by 30 percent in August 2015, forcing more refugees to venture outside the camp to farm. 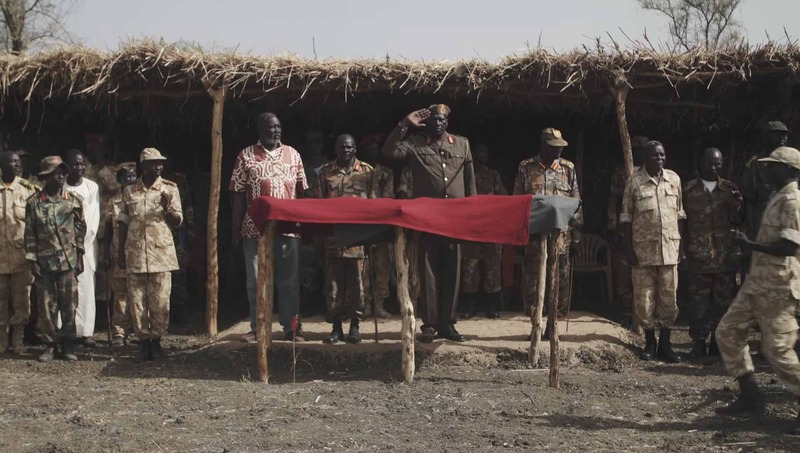 The SPLA fought against the Government of Sudan until the Comprehensive Peace Agreement was signed in 2005. It is now the official army of South Sudan. 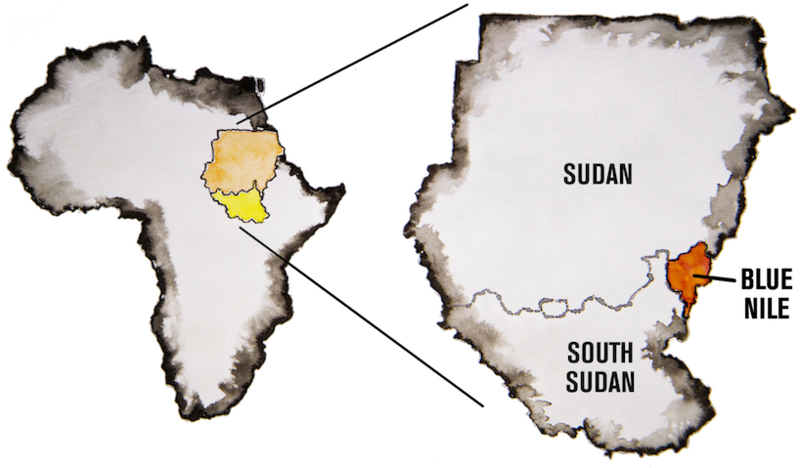 After South Sudan's independence, South Kordofan and Blue Nile formed the SPLA-N to continue the armed rebellion against Khartoum. The SPLM-N is the political wing of the Sudanese rebellion. It is a banned organisation and regarded as a militant group by the government. The government army of Sudan. Signed in 2005, the CPA ended the Second Sudanese war and paved the way for an independent South Sudan. 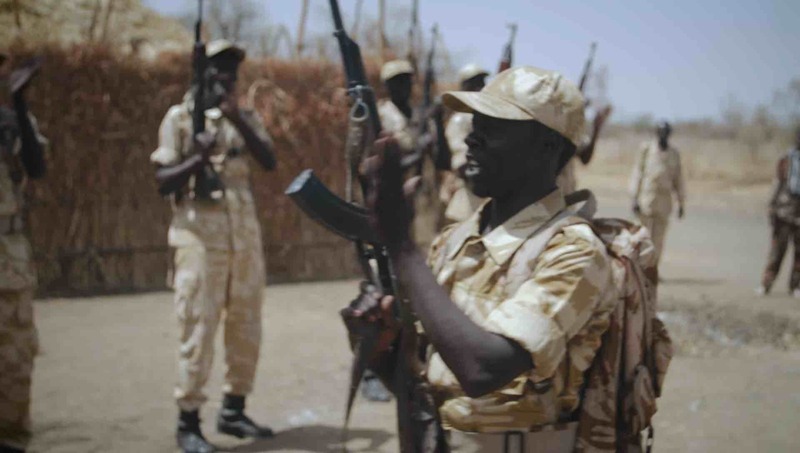 Militia fighting on behalf of the Sudanese government. Former Janjaweed militia rebranded and legitimized as Bashir's personal paramilitary. Political and economic power in Sudan has historically been in the hands of an Arabised northern elite. A series of rebellions by marginalised people in the rest of the country has tried to redress that imbalance. The first armed opposition emerged in the south in 1955 — a year before Sudan's independence. Southern Blue Nile sided with this separatist Anya-Nya movement. A 1972 peace deal ended the violence, but with support from Khartoum new settlers traveled south to Blue Nile and were legally empowered to take over any agricultural land not registered. It uprooted long-standing customary law that had governed Blue Nile for centuries. Sudan welcomed international companies to the south, promoting mineral extraction that led to the displacement of countless thousands. 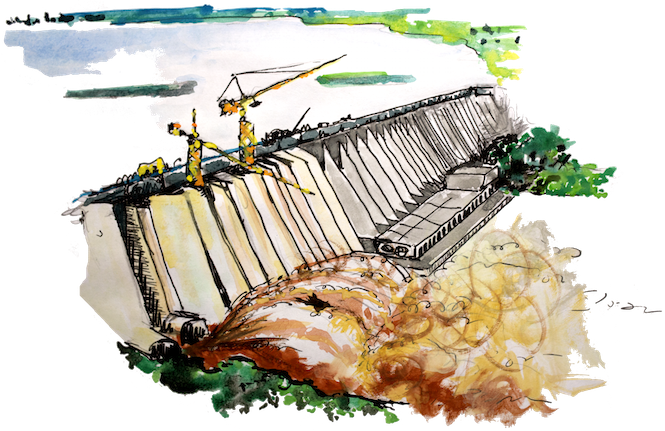 The Roseires Dam, the second biggest in Africa, was upgraded with a power plant in 1971. That power has yet to benefit the people of southern Blue Nile — there is absolutely no electricity in the region. Chinese mining companies arrived in the 1980s, exploiting the gold and chromite deposits in the well-endowed Ingessana Hills. 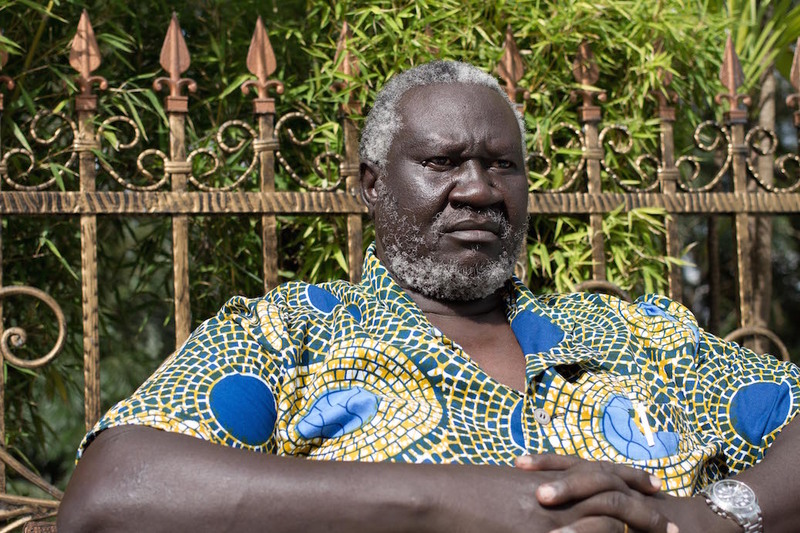 For two decades, John Garang was the heart of opposition to Khartoum and al-Bashir's government. The founder of the SPLA, he spoke of a "New Sudan", an inclusive and democratic society in which Arabs and Africans, Christians and Muslims, would live peacefully and equally together. In the early 1980s, Southern Blue Nile leader Malik Agar (pictured left) pushed through a bid to unite their cause with Garang's. "We were convinced this was a national movement for Sudan, so we said OK, why not join it?" He looks back on this decision as a turning point. Sudan becomes an independent nation after 57 years of British colonial rule. A secessionist struggle in the south is already under way. The Roseires Dam, the second largest in Africa, opens in 1966 and is updated in 1971 with the installation of a 1,800 MW hydroelectric plant, feeding power to swathes of the country. Sudan's second civil war breaks out. The people of Blue Nile and South Kordofan (Nuba Mountains) side with southern Sudan, fighting against their marginalisation by the government in the north. The conflict rages for more than two decades. The Comprehensive Peace Agreement (CPA) is signed, intended to lay out a path to peace to end the conflict. 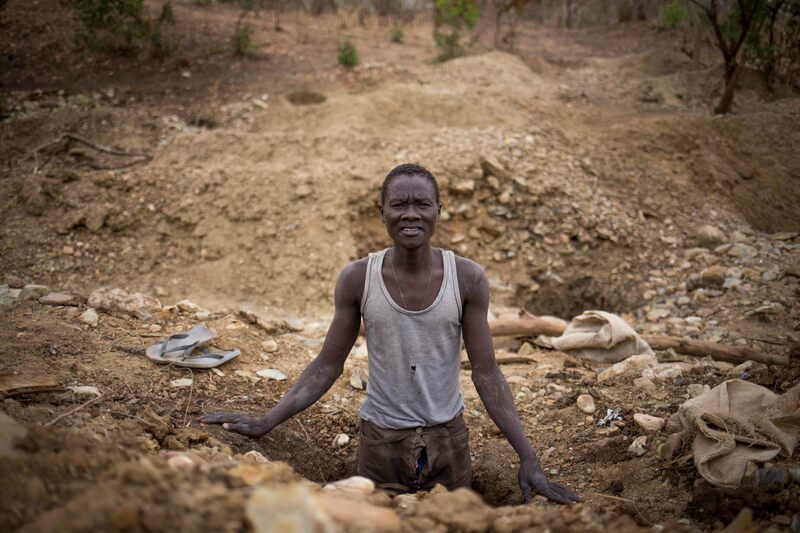 A vaguely defined ‘popular consultation' is promised for Blue Nile and the Nuba Mountains. The failure of this to materialise is a key catalyst in the return to war. 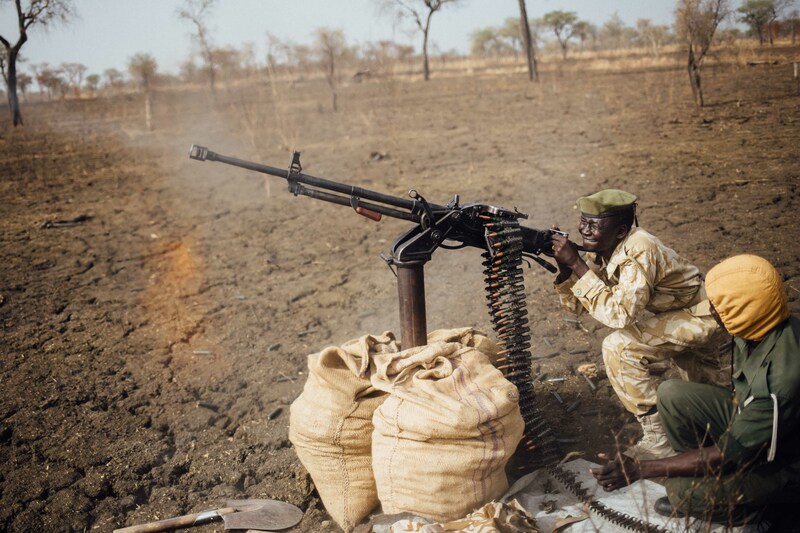 A small skirmish quickly spirals into all-out war in Blue Nile, two months after South Sudan becomes an independent country. Malik Agar is ousted as the sitting governor. The capital of Damazin quickly falls to Sudanese government troops, while stronghold Kurmuk falls shortly after. 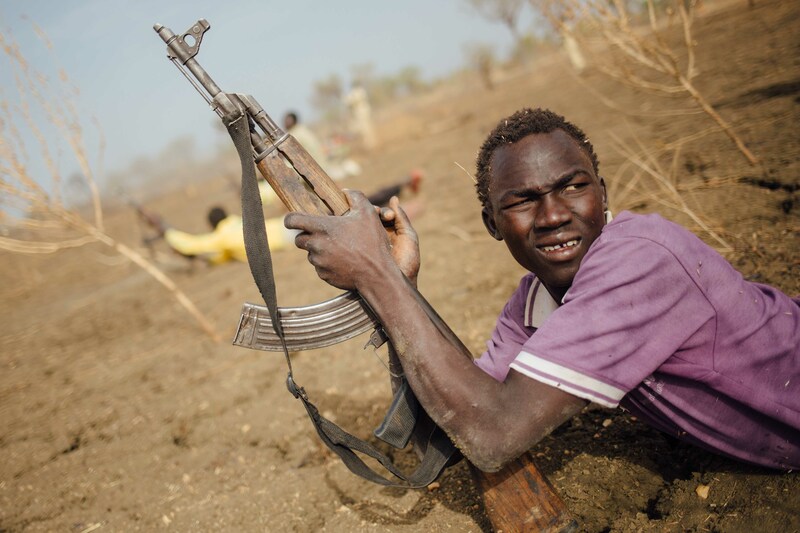 Civil war breaks out in South Sudan, squeezing humanitarian resources and increasing instability for Blue Nile refugees sheltering in that country. The Sudanese government and a coalition of opposition groups including SPLM/A-North meet for the latest round of peace talks in Addis Ababa, Ethiopia. No resolution is reached. Fierce fighting rages in Blue Nile's Ingessana Hills, expanding the conflict into a new front and provoking a fresh wave of displaced civilians. 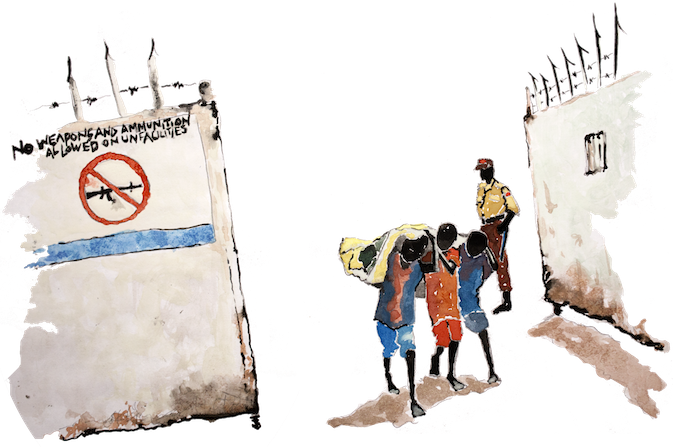 When the SPLA's liberation war began in the 1980s, Blue Nile got swept up in the greater global narrative of rebellion against oppression. "There was this mindset of revolutionary countries," Agar says, speaking of leaders like Nelson Mandela and Che Guevera in a rare interview. 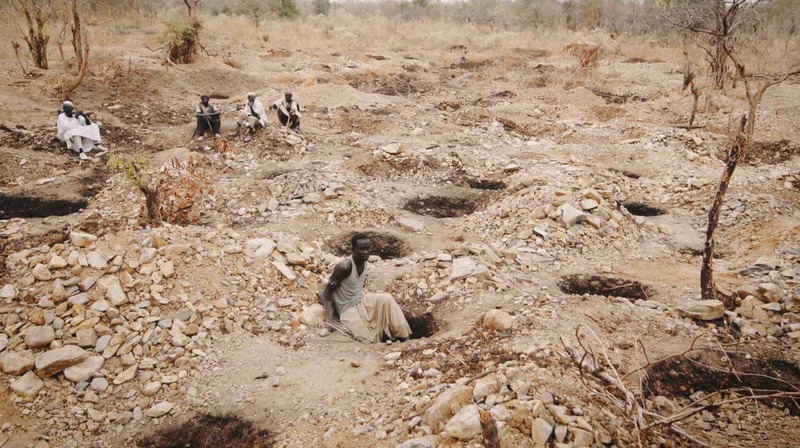 Blue Nile and the Nuba Mountains were the northern front of southern Sudan's fight for equality. It was easy to see the SPLA as freedom fighters against successive Arab-led, and increasingly conservative Islamic governments. Two million people were dead of war, hunger and disease by the time the Comprehensive Peace Agreement (CPA) was signed in 2005. 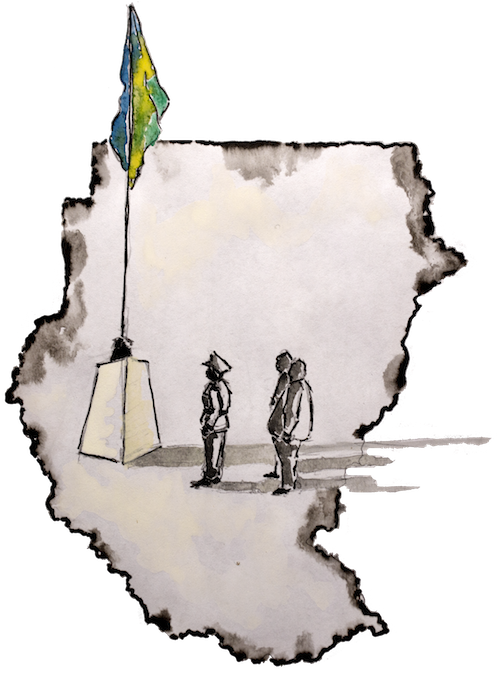 The CPA included a blueprint for a referendum on southern secession, but excluded Blue Nile and the Nuba Mountains. Instead, the Two Areas were offered vaguely defined "popular consultations", and denied the opportunity to secede with those with whom they had fought alongside. Under the accord, SPLA forces were supposed to withdraw from Blue Nile and, in return, the government's Sudanese Armed Forces would downsize. The idea was that a Joint Integrated Unit would be formed. 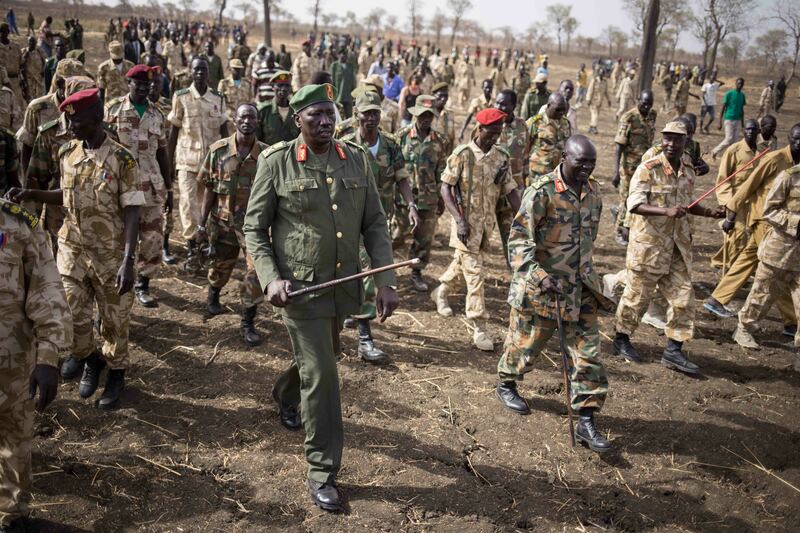 In reality, the SPLA didn't withdraw, the SAF tripled its presence, and the popular consultations never took place. 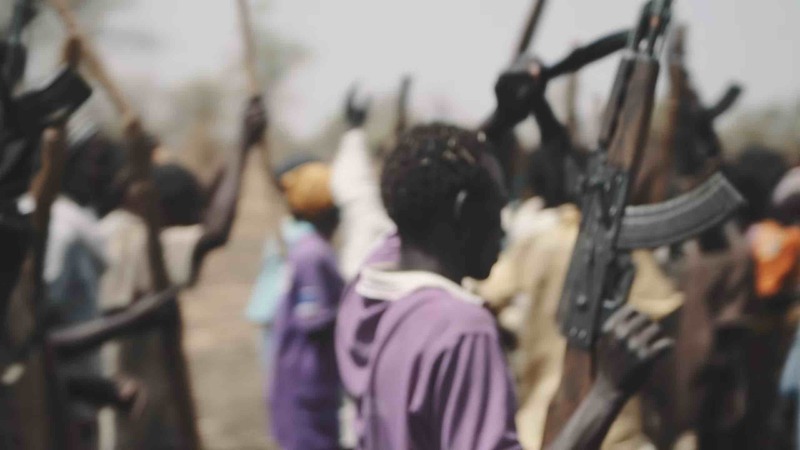 Fighting first broke out in the Nuba Mountains after a disputed gubernatorial election in June 2011. 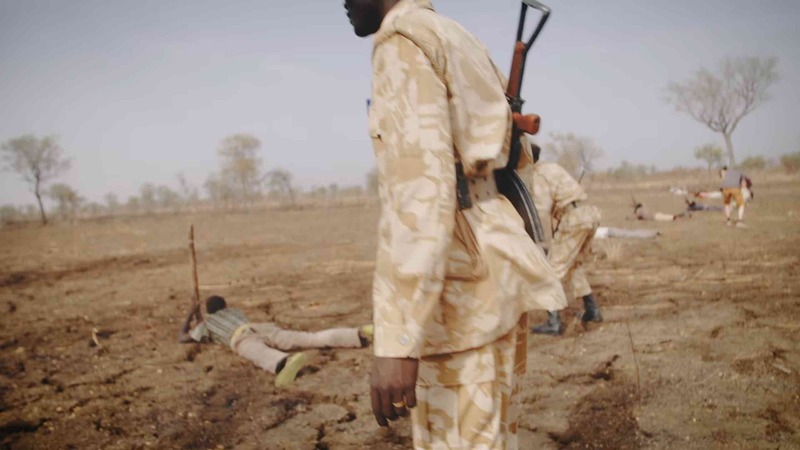 Three months later, a skirmish between what were now SPLA-N troops (the northern faction of the SPLA) and the SAF in Damazin, the capital of Blue Nile, ignited full-scale war. 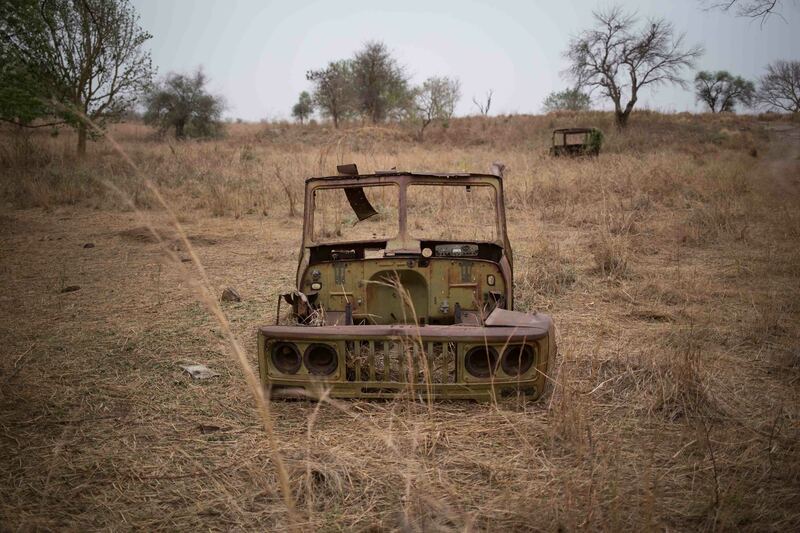 The SPLA-N quickly lost Damazin and two months later Kurmuk, a key opposition stronghold, was gone as well. The revolutionary fire of which Agar speaks appears to have burnt out. 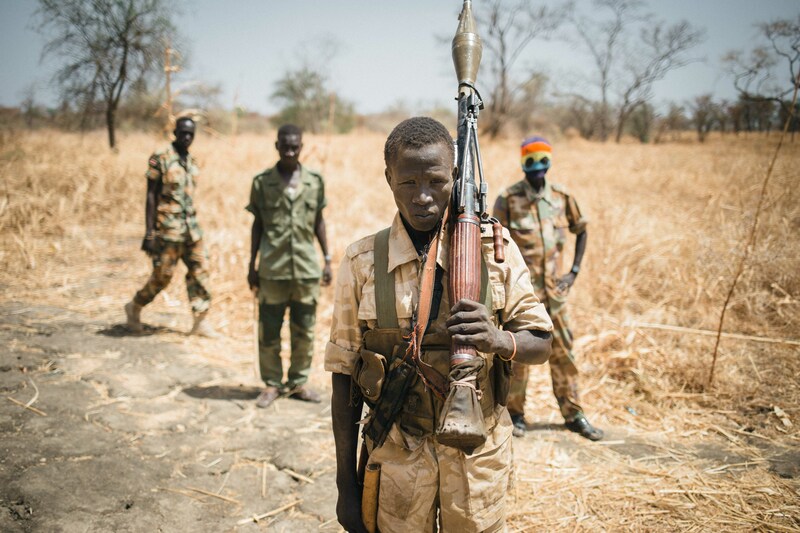 Today, the SPLA-N in Blue Nile is made up of tired, barely-trained, hungry soldiers running to the front with sticks and hoping to grab weapons. Agar explains that the rebel army fights now to make a statement, not to overrun the government and its affiliated militias. "The method of our struggle is the war; so it is a protest," he says. Their aim is to hold their ground, steal weapons, and wear out the national economy. 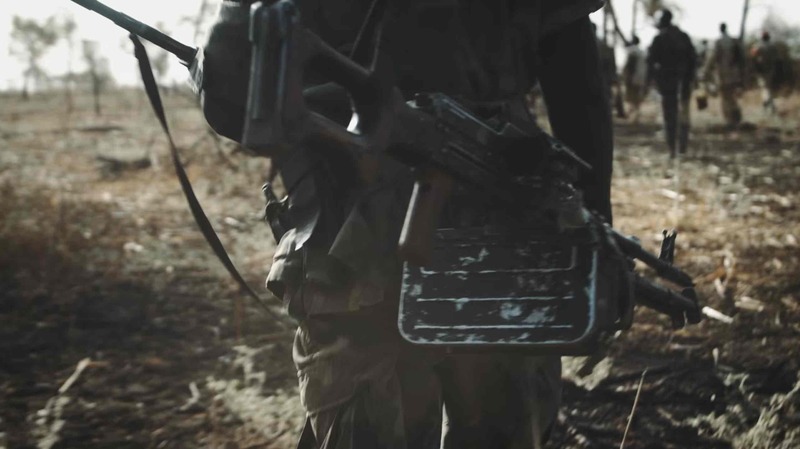 Seventy percent of Sudan's spending goes to the security sector, according to Sentry, an organisation that monitors conflict funding in Africa. "Most wars end on the table," Agar says. "It's like boxing: you can win by final blow, or you can [win] by going back and forth." But the SPLA-N doesn't have the capacity to land a knock-out punch. We saw evidence of this after General Ahmed al-Omda, the rebel commander, enthusiastically encouraged us to attend his graduation ceremony for new recruits. The event took place in Forge, a training camp a 40-minute drive outside Tanfona. At the grass gate of the military compound, we were greeted by crisply-dressed soldiers in fatigues, standing at attention in horizontal lines. We waited for hours for other dignitaries to arrive only for al-Omda to wake up from his nap and tell us it was too hot for the ceremony and to come back the next day. Upon returning to Forge, it was surprising to learn that the healthy-looking upright young men of the day before were not graduates. Around the back of the main compound, on what must have been the training field, rows of people in ragged, oversized civilian clothes stood facing each other. Some looked like teenagers (although all the ones we spoke to said they were over 18). Most were holding long, thick sticks. A few had guns. We learned that some of the recruits didn't finish the training — they snuck out because of the lack of food. Shots rang out in the distance. A flurry of discussion in Sudanese Arabic followed, and we were told we could follow the noise. On the offensive, young men in t-shirts and soccer jerseys lay flat on the ground, legs splayed, guns upright. Weapons jammed: the uniformed elders — apparently supervising — seemed to be enjoying themselves; one tried to light a cigarette off a gun muzzle. 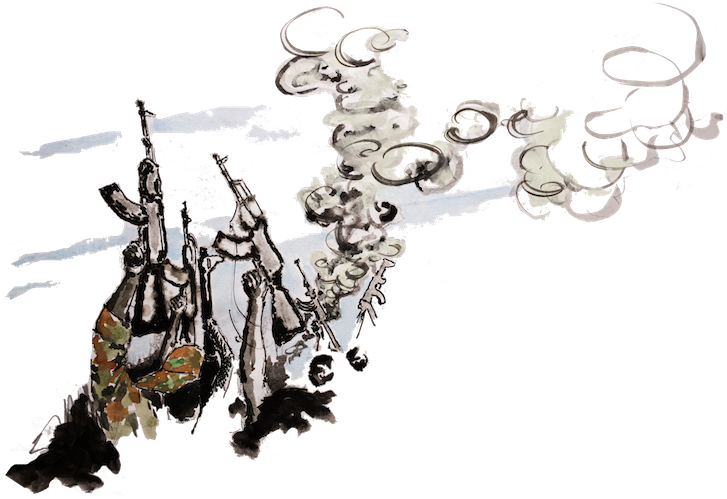 Amid cheers, a thin young woman with a black-and-white plaid scarf wrapped around her head shot off a mounted machine gun. In retrospect, it's amazing no one was injured or killed. This is what the commander had so wanted us to see? After the presentation and hours of speeches in the blistering sun, we were led into the military leaders' chambers for a hearty lunch of stewed goat meat and okra, to be mopped up with flat kissra bread, tea, coffee and cigarettes. It's doubtful the graduates around the back were eating so well. After an afternoon nap, al-Omda was ready for his interview. An imposing man, he spoke to us in a woven chair so wide it could easily fit three of the scraggly new recruits. He wore olive-green pants, a button down jacket with red-tipped collar and a beret. "The weapons that we have, we used to get from our friend Omar al-Bashir," he said, brashly. "You know he's generous to us." 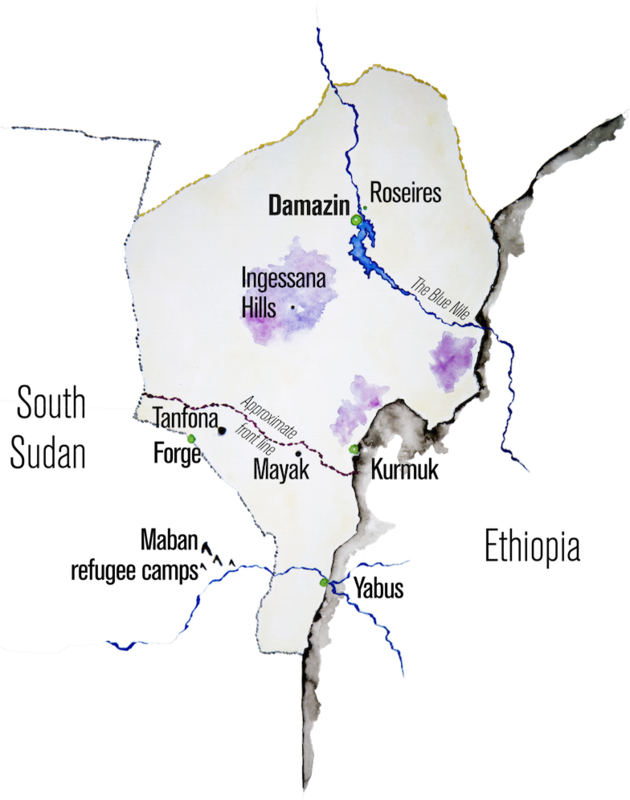 In 2014, the rebels managed to gain ground around the Ingessana Mountains, adding a pocket of SPLA-N territory in the north, and creating a new battleground that now sees the heaviest fighting. Several thousand people were displaced, homes were burned, and mining companies were forced to evacuate. Al-Omda wishes civilians were not forced to suffer because of the conflict, but he is sure it is for the greater good. "We are not intending to weaken the economy of our people, but we are forced to weaken the Sudan economy," he said. Al-Bashir's Janjaweed militia was revived the same year that SPLA-N took back part of Ingessana. Notorious for their role in the violence in Darfur, the militia was rebranded the Rapid Support Forces and legitimised as the army's paramilitary wing. Brigadier General Mohamed Hamdan Dagolo (nickname, Himideti) a former Janjaweed militia leader, is the commander. 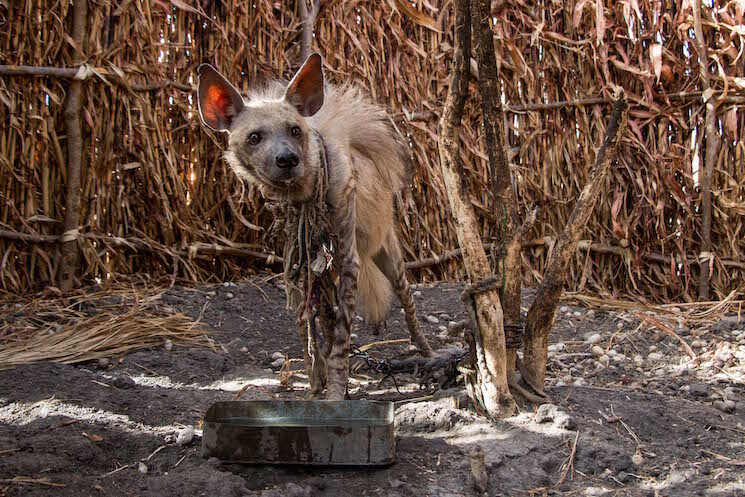 Initially deployed to the Nuba Mountains, they entered Blue Nile in April this year. According to Agar and local NGOs, 10,000 came down from Darfur to Damazin in a fleet of 700- 800 Toyota technicals (trucks with mounted machine-guns on the back). Agar claims hundreds of civilians have been killed. Radio Dabanga, a local media outlet, reported that more than 200 people have been detained for protesting the violence. The RSF are now in control of Kilgo, a pocket of the Ingessana Mountains it won from the SPLA-N.
At the gold mines, young men spend their days underground in fragile, 15-foot tunnels, knee-deep in muddy water; or on the surface, wrestling unmanageable loads of dirt in the suffocating heat. But others climb acacia trees, hacking for gum arabic, another money earner. The sappy, amber ball is one of the most ubiquitous ingredients in consumer products, from Coca-Cola, to shoe polish, to pharmaceuticals and cosmetics. According to the World Bank, global trade ranges from 80,000 to 140,000 metric tonnes annually and Sudan has a market share of almost 50 percent. A gum arabic producing belt stretches across Blue Nile, North and South Kordofan, and Darfur. In 2000, the US imposed sanctions on Sudan over the government's actions in Darfur. It stopped all imports except gum arabic, claiming it would have had too severe an impact on the food industry. It's ironic that the riches in rebel-held Blue Nile get sold up north in Khartoum and fuel the north's war chest. The people climbing the trees understand this but they need money and food now. Mustafa Nimir, a trader, is probably the wealthiest man in Chali, a village of a few thousand people in Blue Nile. He's famous for driving a jalopy: a dusty, rusty white Toyota truck with most of the windows, including the front windshield, smashed out. Townspeople in Chali trade gold and gum arabic for knotted plastic bags of sugar or rough salt at his shop, which Mustafa then sells in Maban. Once Nimir has brought the gold and gum arabic to South Sudan, another businessman drives it to Renk, a town in the northeast on the banks of the White Nile, bordering Sudan. From Renk, it's smuggled across the border to avoid a hefty tax. Once it's back in Sudan, the politics of the trade mirrors the politics that fuel the war. As Nimir tells it, the oppression that caused the ethnic and ideological war between the north and the south manifests itself in Khartoum. According to Nimir, it's more difficult for Africans than Arabs to obtain permits to buy and sell minerals and gum Arabic. But Nimir knows one dark-skinned man who lives in Khartoum who has the right pass and can make the purchase. From Khartoum, it's sent to Qatar, and from there exported to the rest of the world. Nimir has been cut off from his family since 2011. They were in government-controlled territory when fighting broke out and he hasn't seen them since. He's known for being an SPLA-N sympathiser and it is not safe to return. When he calls them, he worries the government is monitoring the line. He told us he cries at night, thinking of his family. Nimir doesn't like that his trade funds the same war that's killing and mutilating his people, limiting his own prospects and keeping him from his family. When asked why he persists, he holds up his hands. His gesture says: "it's not personal, it's business". Blue Nile holds great promise. It sits on a literal gold mine. 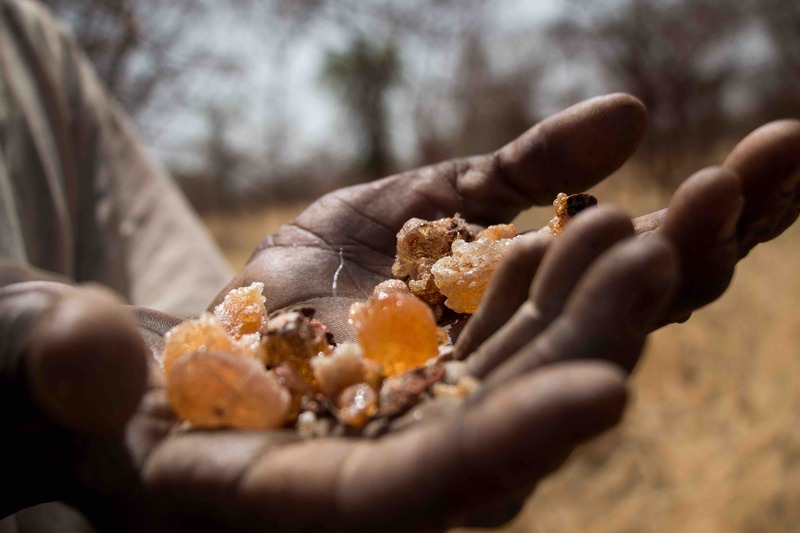 The land is the most fertile in the country, and even in the midst of the conflict, gum arabic is a major contributor to the economy. War keeps this place of real potential destitute and depopulated; fuelling an urgent humanitarian situation both inside Blue Nile and across the border in Maban. Things are so bad in Blue Nile that people prefer to live across the border in South Sudan's war zone than stay here. And there are no signs that peace is coming. Sila Musa, a former commissioner of Kurmuk now living in exile in Maban, can trace his entire existence along the war's timeline. "I was born in the time of fighting," he says, beginning his life story. And the future? "I hope that the Sudanese people will learn from what happened before, because we've been fighting for almost 60 years," he says. It's entirely possible Musa will live his whole life without ever knowing real peace.